Lake Ashton in Lake Wales, FL is surrounded by rolling hills and citrus groves. This popular gated active adult community is located in Central Florida overlooking the lovely Lake Ashton. This gorgeous 55+ neighborhood boasts a gated entry, beautiful homes, resort-style amenities, two private 18-hole championship golf courses, and plenty of clubs and events. Active adults will find their perfect dream home and enjoy recreational as well as social activities with neighbors all year round. Lake Ashton's amenities include a 26,000 square-foot clubhouse and a 30,000 square-foot health and fitness center. The clubhouse features an assortment of amenities that include an exercise center, sauna, dining and lounge facilities, game room, woodworking shop, card room, arts and crafts room, billiards, meeting room, computer lab, and library. There is also a catering kitchen and two grand ballrooms that have a large stage for live entertainment, dancing, and other gatherings. Residents can enjoy the theater with surround sound, which is the perfect place to meet friends and neighbors to see a new movie. They can also reserve the cinema to host a private movie viewing party. Homeowners also have a four-lane bowling alley where the community s bowling leagues meet for friendly games. The health and fitness center features a state-of-the-art fitness center and houses many of the other fitness and recreational activities that residents can utilize to stay active and healthy. Residents can stay in shape by using the indoor pool, basketball court, racquetball court, pickleball, weight room, sports, and aerobics area or walking track. There is also a card room, media and library room, crafts room, multi-purpose room, massage services, and catering kitchen. Lake Ashton has two private championship golf courses, a fully appointed golf pro shop, and a full-time golf pro. Active adults can meet with friends for a drink at Eagle's Nest Sports Pub or drive a bucket of balls at the driving range. Other outdoor amenities are sure to please homeowners in Lake Ashton because there is something for everyone. Residents can swim in the large outdoor pool, relax in the spa, play a friendly game at one of the lighted tennis, bocce ball or shuffleboard courts or have some fun while playing lawn chess or horseshoe pits. Lake Ashton has a boat launch ramp and docks with slips for boat owners as well as lakes for fishing or boating activities. CRF Communities began construction in 2004 and upon completion, it will contain 1,600 homes. Design consultants are available to help homebuyers personalize their dream home with an endless selection of countertops, cabinets, and flooring. Lake Ashton offers a variety of floor plans for single-family homes that are available as new construction or resale. The Carriage homes, which are a small section of condo units, offered in Lake Ashton are available on a resale-only basis. Single-family homes within the Islander Series range from 1,094 to 2,521 square feet of living space. They have two to three bedrooms, two bathrooms, and an attached one to a two-and-a-half-car garage. These models feature open floor plans and low-maintenance exteriors. The Adventurer Series are single-family homes that range from 1,290 to 2,560 square feet. They have two to three bedrooms, two to three bathrooms, and an attached two-car garage plus RV and boat storage. Many homes enjoy water or conservation views of the community. Active adults will find Lake Ashton the perfect place to enjoy retirement living at its finest. Popular clubs such as a book club, computer club, veterans club, and current affairs group are available to residents. A full-time activities director is on-site and helps organize and schedule events, classes, activities and groups like arts and crafts activities, oil painting classes, pottery classes, scrapbooking, woodworking and cooking classes. Lake Ashton also has a softball league, basketball league, and bowling league. 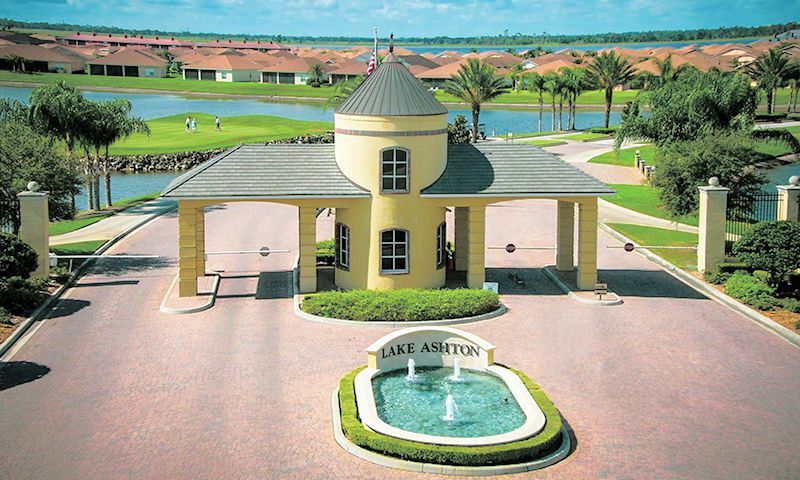 Lake Ashton is set right in the heart of Central Florida, just off Highway 27. It is a short one hour drive to Tampa where residents can visit Busch Gardens, a popular amusement park, and zoo. Lake Ashton is a stone's throw from Bok Sanctuary, Lake Kissimmee State Park, Cyprus Gardens and Lake Wales Ridge State Park. Active adults can take their grandchildren to Disney World, SeaWorld or any of the other attractions in Orlando, which are an hour's drive away. This popular 55+ community is near medical facilities, shopping malls, grocery stores, and numerous other businesses. Active adults will love calling Lake Ashton their home in this age-restricted neighborhood ideally located in Lake Wales, Florida. The Health & Fitness Center offers all of the physical and recreational activities for residents at Lake Ashton. Health & Fitness Center - 30,000 Sq. Ft. There are plenty of activities available in Lake Ashton. Here is a sample of some of the clubs, activities and classes offered here. Carriage homes are available on a resale-only basis. These 20 units are located in a small section of Ashton Palms Drive. Homebuyers can choose from a first floor or second floor model that have two or three bedrooms, two or two-and-a-half bathrooms, and an attached one-car garage. Please Note: Not all floor plans are available at this time. These single-family homes within the Adventurer Series range in size from 1,290 to 2,560 square feet of living space. They have two to three bedrooms, two to three bathrooms and an attached two-car garage plus an RV garage. These homes are available as new construction or resale. Please Note: Not all floor plans are available at this time. Single-family homes within the Islander Series range from 1,094 to 2,521 square feet of living space. They have two to three bedrooms, two bathrooms, and an attached one to two-and-a-half-car garage. Models are available as new construction or resale and feature open floor plans and low-maintenance exteriors. Please Note: Not all floor plans are available at this time. Love, Love, Love Lake Ashton! My husband and I retired from Palm Beach County to beautiful Lake Ashton in 2008. This community has wonderful amenities, activities and entertainment. The warm and friendly people that live there make it the "BEST" 55+ Community in Florida. It is 60 miles south west of Orlando and 60 miles east of Tampa, so airports, high end stores and many, many restaurants are close by., Living here is like being at a resort everyday. It is our "little piece of Paradise." Come for a visit and you will fall in love with Lake Ashton, too! Love it here, so much to do, absolutely beautiful, people are very friendly. Movie theater, bowling, tennis, 2 pools, one inside and one outdoor, shuffle board, great shows, numerous clubs, etc. etc. etc. Great place to live! I am a resident of Lake Ashton but haven't moved to FL. I will be working for a few more years here in DE but I wanted to tell you that Lake Ashton has been wonderful so far. I closed on June 27th and within an hour I had met four neighbors who stopped by to welcome us...that's how nice they are. We are really looking forward to moving and enjoying the whole experience of Lake Ashton, instead of just one week a quarter. We've been enjoying everything about Lake Ashton since moving in about a year ago. I have tried out lots of the clubs like painting, dancing, cards, camera club, tennis ... lots of different things I've never tried before. It's been a blast trying new things and meeting so many nice people. I am enjoying finally having time to join my husband on the golf course and have even taken some lessons. We also like that the community has some unique features you don't find many other places like a few bowling lanes, RV storage, racquetball and the massage room ... ahhh, the massages are great! We highly recommend Lake Ashton to all our friends! 55places.com is not affiliated with the developer(s) or homeowners association of Lake Ashton. The information you submit is distributed to a 55places.com Partner Agent, who is a licensed real estate agent. The information regarding Lake Ashton has not been verified or approved by the developer or homeowners association. Please verify all information prior to purchasing. 55places.com is not responsible for any errors regarding the information displayed on this website.